You know those food magazines that you flip through while in the checkout line at the supermarket? The ones you put back on the rack, all the better for knowing that you can make a casserole out of a can of soup and 35 egg whites? Yeah, well, I buy those magazines. All of them. It is my secret shame. But this week a magazine cover gave me the chutzpah to do what I’ve always wanted to… put Thai red curry paste in everything. Or at least chili! To be fair, the magazine was Clean Eating, which usually has pretty awesome non-soup can ideas. And the original recipe was even vegan, so yay. This isn’t their exact recipe, I just ripped off the idea (jeez, I have some integrity). It’s just as awesome as you would imagine if you threw together a Thai curry and a chili. OK fine, maybe that doesn’t sound awesome, but it was! I used red lentils for texture and kept the main ingredients as is: sweet potatoes and big meaty kidney beans. It’s really satisfying and blessedly easy so make it the next time you want to switch up your chili repertoire. It makes a lot so freeze the leftover and have chili whenever you want. I bought that same magazine Isa! It sounded like such a great combo for chili. I love your take with the red lentils. I’m going to make it tomorrow night for dinner. Thanks for sharing. Hope you’re surviving the Mid West winter. How has it been so far? Isa, any suggestions for a brand or make of red curry paste? I love those magazines. I don’t buy them but my co-worker does and I always secretly hope she’ll bring them when we work together. The spicier, the better! Looks like I know what kind of chili I’m making this weekend! I have that “Clean Eating” mag. I subscribe to it, because they usually include a lot of recipes that are naturally veg, and the others are easily veganizable. I think the sister magazine is “Oxygen,” and I rather like that one, too. Often includes a lot of tasty recipes that are also easily made veg, and the smoothie recipes are always interesting and yummy. The health and exercise advice is pretty good, too. Also generally fond of “Women’s Health.” Those, along with “Vegetarian Times,” are the only mags I’ve found worth it lately. Had to cancel “Cooking Light” because everything was too labor intensive, boring, and not really much I could do to veganize them. Interesting Food Links, News, and Recipes. | Happiness is a warm oven. I made this tonight, one of the many PPK/Isa Chandra recipes in my arsenal. It was absolutely delicious! Yum… I wish I had that for lunch right now. I made this for lunch today. It was excellent, Isa…thank you for another one. My friends think I am some super chef now. I just say “naw…my cooking coach Isa is…I just follow directions really well” then direct them to your site. I did not have lowfat coconut milk, just the full on “keep my love handles” version, and it was a multi-cultural feast. As for the post above asking brand of paste I used Maesri brand, always like their pastes. Homemade paste is easy though if you have access to ingredients like lemongrass. Oregon is not in the Midwest. It’s in the North West. Just FYI. Made this today for a vegan potluck/graduation celebration/going away party. It was amazingly delicious and so easy to throw together this morning! The fam is really excited about dinner tonight and the whole house smells divine. Thanks, Isa. You make me look like an amazing chef (amazing chef with a very happy belly ;). Love this one. New favorite chili recipe for sure! This is SOOOOOOOO good! All other chili recipes pale in comparison. I used Thai Kitchen red curry paste, from Whole Foods. I sauted the onions, garlic, and pepper, then put all ingredients except the coconut milk and cilantro in my slow cooker. Cooked it on low for 6 hours, then added the coconut milk and cilantro and continued cooking for another half hour or so. A squeeze of lime juice was the crowning touch. Best chili ever! Making this tonight! I didn’t have any sweet potatoes so I’m using white. Also I love cilantro so I’m using twice as much. Thanks for the recipe!! AMAZING! I used regular coconut milk and it was delicious! This sounds awesome; I can’t wait to try it. Spicy, spicy, spicy this winter! Yep, as everyone says, this was delicious! Very easy, comes together quickly and super tasty. I made mine spicier with red chili peppers & added some cinnamon too. Served with cilantro, lime rice. Thanks for the great recipe! Oh. My. F*#(%@. God. This was amazing!!!! I don’t know how we would have made the transition to vegan without your recipes. Thank you, thank you, thank you!!!! I am making this right now, to bring to a potluck tomorrow night. Right now everything is boiling and it smells so, so, so good. Thank you for posting this! When I suggested making this for dinner my husband (Javier Villegas) moaned and groaned about fusion food, well, I’ve just watched him polish off two bowls so I’m feeling pretty smug right now. Next on the must make list are the mexican hot chocolate snickerdoodles, but after a day of hunting NYC for chocolate extract he’s convinced that Isa made it up and it doesn’t actually exist, but I’m determined to prove him wrong. Thanks for the recipes! This looks amazing – great way for me to get over my “lentil fear” (i.e. I’d rather someone else prepared them, preferably in dal form)…now I just have to make it to the store! This is a great recipe! Even my picky 5yr old loved it and ate every bite. I made mine in the slow cooker as suggested in a previous post, got off work this morning, put it all together, and woke up to a great meal! I can’t believe I forgot the cilantro and lime! Even without it, the chili was fantastic. This one is definitely a keeper. I served it with naan, but it would be great with rice or cornbread, too. Soo good! I made it tonight and I had to put it away so my boyfriend and I didn’t eat it all. I didn’t have a bell pepper, but I used 2 good sized jalapenos and took out the seeds and cut down a bit on the chili powder and curry paste so it wasn’t too hot (but I like it pretty spicy) and put it over Basmati rice. We are just starting to cook vegan and this makes it seem really easy, thanks! @anon: Maybe Julie was confusing Isa with Dara Moskowitz, the (James Beard-winning!) food writer, who does live in the Midwest. or maybe Isa really does live in the midwest???? also anonymous posters can bite me. Isa lives in Nebraska, not Portland. But thanks for giving me a geography lesson. This was really good with rice noodles, and a beer, and huge snowdrifts outside our house. This was ridiculously crazy good. Fed us for four meals (one including friends who had seconds!) too! Best PPK recipe I’ve tried yet. In my version, I used reg coconut milk, one can kidney & one can black beans, and Geo Organics red Thai curry paste. Yes! I made this last night .. and this was SOOO good. I halved the recipe, since it’s just the 2 of us. I also made a few modifications based on what I had: used chickpeas instead of kidney beans since we didn’t have any, used spring onions (green part) instead of cilantro! So so so so good! Will definitely be making this again! Has anyone tried this in the crockpot? Sounds yummy! I got a subscription to that magazine for Christmas as my sister keep raving on about it. Its nice to see this slightly altered version as I couldnt find any bulgar in my small town and Im dying to try these flavous together. Thanks for the inspiration! The lentils don’t have to be soaked. They cook faster if they’re soaked but it’s not necessary. And yes you can freeze lentils! this was by far the best chili i have ever had!! Thank you!! This chili is the best I’ve ever made. And I’ve made a lot of chili. I used pinto beans instead of kidney because it’s what I had, and dried cilantro (1 TB) instead of fresh. Oh, and I threw in a zucchini just for fun (diced and sauteed). Thanks to the commenter who provided slow-cooker instructions, because that’s what I did, too! I love guilty secrets like checkout-line mags. I don’t have that addiction–my Mom cured me of it wtih her own. But chili powder and curry paste is a remarkable combination. Reminds me of those recipes that ask you to put marshmallows and sweet potatoes together. I’m sure it does taste good, but it takes some kind of brave heart to try it. Or an Isa in the kitchen. This is the first recipe I tried from your website and it is sooo delicious :-)…I am pretty sure that I will try some of your other recipes too. Yummm! Awesome recipe, I made this tonight. My 2 year old gobbled it down (I was worried it would be too spicy but it wasn’t at all) and so did my Man. And Lots left over for quick lunches/suppers. Mmmmm…. I served it on some plain Jasmine rice, but I think for the next time I’ll just have it with some sort of flatbread to dip. Thanks for the great recipe! Holy Crap! This is the best thing I’ve ever had! I made it last night for dinner, and I am eating some leftovers for lunch right now. I think I may be addicted to this chili. Seriously. I have made it three times now. Twice for potlucks and the other day just for me. I have about six servings (always have it with a side of steamed veggies) that I put in the fridge and then individually bag up six more in the deep freeze. Thai Chili all the time! woot! SOOO Yummy! I replaced red lentils with green lentils [it had to boil double time] and then doubled up on chili powder. It was amazing! There were two bowls for my friend and I, enough for my next door neighbors..and there are STILL leftovers. Totally worth the trip up to Meijer. Thanks Isa! Another great recipe. I just made this tonight. This is so good. I plan to stock up on red lentils this weekend, so I can make this often! make this recipe even healthier by sauting vegs in water or broth rather than oil! Doesn’t change a thing other than fewer calories and teh taste of the vegs come thru even better! This is my first time coming to this site and I did try this recipe. I give it two thumbs up – I used 3 tbspns instead of 2 for the curry paste. This made a HUGE pot – plenty of leftovers – flavour country 🙂 thanks for posting. I tried this and it was VERY good. An non-vegan loved it and I can imagine for a hungry crowd not exactly freindly to vegan would LOVE it. Good job.Unusual ingredients, and easy. Gracias. Made this tonight and loved it! The whole house smells like Thai. We’ve got a ton of leftovers. Just delicious! Holy crap, Isa, this is great. Made it. Loved it. Blogged it. Froze it. THANKS! can you use soya milk instead of coconut milk for the thai source? If you have already answered this sorry. Soy milk doesn’t have the same sweet creamy quality, but you can certainly try it. I would say if for some reason you don’t want coconut milk, cashew cream would be the next best thing. I have angina and try to follow, when i can, a low fat diet as per McDougall, Esselstyn etc. Coconut milk is, I am told, very high in fat and so I was just wondering if there was something else I could use. Seems a pity not to try the recipe because of one ingredient but if that ingredient is important well …… and by the way hello from Wales. Oh sure, I would actually just forgo the creaminess if that is your diet. The chili will still be very good, just more of a traditional red chili. If you can squeeze in even half the amount of lowfat coconut milk, though, that would be great, too. Thanks for your time and advice. Appreciate it. @Geraint, I made this without the coconut milk because I didn’t have any and my local grocery store was out… my entire family (meat eaters and veg alike) LOVE it. We have made it 3 more times so far. Just leave it out, it will still be really tasty and super healthy. Awesomesauce!!!!!!!!!! I think I can help my mom with this. Her vegetarian curry does not taste very good because it doesn’t have garlic or onions. What are other ingredients could replicate the taste of those spices? We’re making this dish again tonight for probably the 100th time- everyone loves it! We have a house full of allergies (gluten, dairy, soy, and tree nut) so finding vegetarian meals are difficult but this one fits the bill! My one-year-old and two-year-old love it too! I’m allergic to coconut – is there anything that would serve as a good substitute for it in this recipe and others like it? Oh my goodness. This chili is amazing! My boyfriend and I have been talking about going completely vegan as apposed to vegetarian and this and all of your other recipes are making it seem so much easier! I remember when I was in High School my roommate wanted to be vegan and she was for a few months, she made this sweet potato ginger soup and it has forever been my favorite soup and I always talk about it. Anyway, when my boyfriend were talking about how much of a challenge it would be to become vegan I brought up that soup and said to him “with food like that it really wouldn’t be that difficult” and as I was looking at the books you’ve written I noticed the one that had that recipe in it that my friend used to make that soup! Sorry for the long rant I just want you to know your food has been a factor in my decision to become a full fledged vegan (aside from the obvious health and moral reasons). Thank you for all of your hard work! YUMMY! A taste explosion. And so simple to make. I’ll be passing this recipe along! Has anyone tried freezing this? Any iuck? I find usually soups/curries/stews work pretty well in the freezer but wanted to know before I risk wasting any of this delicious concoction. Absolutely delicious. I use parsnip instead of sweet potato (having a hard time finding any), and it works great. I just made this, and it was excellent! I used adzuki beans instead of kidneys since I’m not crazy about kidney beans, and it was delicious! I wouldn’t have thought of this idea on my own, so thanks Isa for another brilliant recipe! Mine turned out orange, but it is still fantastic!!! I can’t get over how much this recipe makes. We just moved to Chicago and after eating cereal and microwave veggie burgers for our first weekend I am so happy to have some real food! Thanks a million! After seeing the photo of this chili I knew I had to make it. I made it for a group of 8 female friends and they all loved it. I keep sending more and more people to your web site and have bought a few of your cookbooks for holidays. Keep up the great and yummy work. 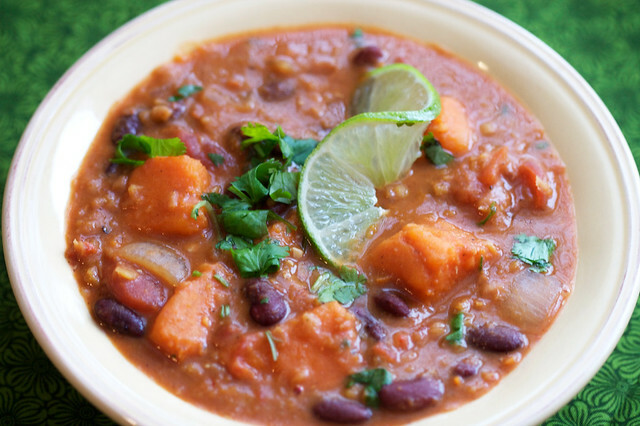 The meaty flavor of the kidney beans against the soft and sweet nature of the sweet potato was sheer bliss! So much tastier than beef chili! The sweet potatoes really make the dish sing. Your blog has made going vegan very easy. I made this and it was amazing. I added Garlic Chili Sauce for an extra kick. I will absolutely be making this more often. Very good. Savory and spicy. Perfect for the cooler season. Thank you. ph my goodness. this is almost orgasmic. this is soooooooo good. i wanted to lick my bowl. i still might. i want to call around to strangers and tell them about this. like missionaries for this chili. your life will be changed by this. 🙂 so going into the steady rotation. heaven in a bowl!!! only had one sweet pot so used that and a yukon gold. this one will be put into the rotation! thanks again!!! Can I use panang curry paste? All I have… Thanks!! I used panang curry paste in this last night, with green lentils and regular potatoes since that’s what I had. It was fantastic!! Seriously. This stuff is AWESOME! Amazing. So healthy and creamy and just spicy enough. Even the 12 year old boy who HATES red peppers and tomatoes LOVED IT!!! How was I ever vegan before I found your cookbooks? Delicious! So quick to make, so great to eat. My carnivore friend raved for 2nds too. Thanks! Can’t stop eating this! Pure deliciousness! I’m so glad that you posted this, because I saw this magazine and didn’t buy it! Now I wish that I had. Thanks for sharing your take on the recipe- can’t wait to try it! I made this tonight and it was awesome! Even my picky 8-year-old thought it was delicious! This was awesome!! Will definitely be making this again! This was a FABULOUS dish! Thank you! Delicious, filling, tasty. My grown sons took most of it !! Guess I’ll have to make another batch. Thank you. I think I’ve commented here all too many times about this chili already, but just tried it today in the slow cooker as per someone else’s suggestion and it still reigns supreme! (granted, know your slow cooker, I was way off, ended up taking six hours on low plus two on high, then one more on low with the addition of the coconut milk and cilantro). Freezes beautifully for batch cooking, I’ve found. I’ve made this a a handful of times and have always loved it. Today I was thinking of making but didn’t have any tomatoes, red peppers or sweet potatoes. I used squash instead of potatoes, added chili garlic sauce and nutritional yeast. The results were fantastic. I love recipes like this where you can substitute/leave out some ingredients and come out with something very similar and quite tasty. would love for you to add the nutritional information to this!! Just made this….delicious. I am a new veg – a – something and discovering this world of cuisine. I think a different bean would be better…I served it with hot sweet chile sauce and chopped pickled ginger and jasmine rice- really good. This might be my favorite recipe of 6 weeks of experimenting with vegetarian/vegan cuisine. I highly recommend MAESRI brand red curry paste, available in asian grocery stores – it is excellent; I have used it in a variety of thai curries and have never been disappointed. The only Thai Red Curry Paste I was able to find was the Mae Ploy brand and it contains shrimp paste… which brands are Vegan? And where are they available for purchase? (I’m located in Las Vegas). Thanks for your help!! Shawnee, I’d go to an Asian market, I’m sure there’s one near you if you’re in Las Vegas. They should have many varieties! I made this for the third time tonight and changed up the recipe. I used heirloom lentils and added some sweet frozen white corn. An awesome recipe! I found this through Pinterest and made it for a once-a-month cooking group. It turned out delicious! My husband loved it, and he is a total carnivore. I cooked three giant batches, each in a slow cooker. The batches are HUGE (easily 12 + cups) and I would recommend putting the slow cooker on high for about 45 minutes, then on low until the sweet potatoes are tender (I think it took about 3 1/2-4 hours). You can get Thai Red Curry sauce (and light coconut milk) relatively inexpensively from Trader Joe’s. I found dried red lentils in the Asian foods section of the grocery store. Good stuff. Just made it. I’m on for bringing dinner tonight to our board gaming weekly event. And this is going. I’m eating it for a late lunch. The flavors will meld well between now and then. The lentils really add a nice texture. I did chop up two corn tortillas into small dice and add them towards the end of the frying of the onions & peppers phase. I also added about 6 ounces of frozen corn to mine. It could actually use more beans, I think. Isa, just found this recipe a couple of days ago as I was trolling around your site looking for that certain something that I felt like eating. This chili was it!! Went together so fast and is absolutely amazingly good! Felt compelled to make the raspberry truffle brownies just to gild the lily a bit — 16 year old son got most of those, but I managed to sneak a couple! I found this recipe while riding the bus. It was one of the overheads. I couldn’t wait to go home and check it out. Chili is delicious. I made it for my fourth of July cookout and it was a big hit. I have one question “what is the nutritional values?”. I’m keeping a log and just needed to know. I cooked wheat berries yesterday to make a chili…so I’m going to try this recipe with wheat berries…That can’t be bad, can it? Packed lunch ideas for a high school student? This was delicious! I had co-workers taste test and everybody liked it. It is definitely a keeper and will make again. I love this chilli soooo much. its the only vegan chilli that I’ve ever really loved. It’s literally become a staple of my diet. I live alone so I make a big batch and freeze it. Thanks so much for this! Oh my goodness. When i read all the other reviews, I thought to myself, could tasty could it be possibly be?! I stand corrected……it is absolutely amazing and has so many levels of flavour to it (and with so little effort)! Thank you for this awesome vegetarian recipe. I am always looking for ways to incorporate vegetables in a healthy and delicious way so that my 2 year old can appreciate healthy eating! I made this recipe for a chili cook off tonight. I was the only vegetarian in a room of about 25 carnivores and 6 different crockpots of chili. I took second place! I only missed being champion by one vote! One guy came up to me and said he had decided before I even arrived that he wasn’t going to like my chili because it was meatless, but I proved him wrong. Fantastic recipe, Isa! I’ll be making this one again and again! Thanks for posting! This may be a dumb question, but are the sweet potatoes peeled? Or, do you leave the peel on? It’s 20◦F here in Colorado, so I think this will be a great recipe to make! I added hot Rotel in place of the diced tomatoes. It gave it an added kick of spiciness, just the way I like it. What a great recipe! One of my favorite dishes to make and everyone loves it! Thanks for sharing!!! Hi- I am looking for freezer recipes- would you put this all together minus the coconut milk and then reheat and then add the remaining ingredients and coconut milk? I want it to be as put together as possible. I would just freeze the whole shebang. Has anyone made this in a slow cooker? I can make it on the stove, but wondering how it will hold up with the coconut milk if I bring it to an event where it will sit for a couple hours. I used Thai Kitchen Red Curry paste with this and it was AWESOME. this chili rules. I followed recipe, adding cumin and some cayenne for smokiness and kick. I serve it with lime zest/cilantro rice. Really hearty and balanced. Just made this with a homemade thai curry paste. It was really good. Goes well with bread. thanks for the recipe. PS: I have no integrity whatsoever:-) I made exactly as is here. OMG this is the best thing I’ve ever made. EVER. It’s a taste explosion! You are my god. I followed the recipe to a T and was not super thrilled with it. It smelled and tasted great up until the coconut milk. It just gave it the weirdest flavor after that. Might just be my personal taste but if you know for sure that you don’t like it I wouldn’t put it in. Oh my, sooooo delicious!!!!! I deviated slightly by tossing everything except the cilantro and lime juice into the slow cooker at once, using soaked but not cooked dry kidney beans. Also crumbled 2 lbs of tofu into the mix as I’m a protein junkie. What has resulted is truly the yummiest chili/curry ever, with an authentic chili consistency. I’m a newly converted former carnivore, and can’t wait to try more of your recipes! Just made it, awesome !!! Added spoonful of sesame paste. This was delicious! I added an entire can of chunk pineapple, juice and all, for a little more sweet and fruity. Fantastic. The Fall Bug Has Bit | Make them whole foods. Make them delicious. And make sure you feel great eating them. We’ve made this several times, and I just had to say thanks! One time my husband even used the”chili powder” he mistakenly bought from the Indian market, super spicy that time but still great! You rock, chica! Just made this and it was sooooo delicious! Thank you so much for sharing this amazing recipe. Have made this several times and loved it, but haven’t for awhile now that we have a coconut allergy in the family. Decided to try it today without the coconut milk and loved it just as much, if not more. Also added some extra ingredients I wanted to use up: mushrooms, celery, and mango, and used 1 can each of kidney and black beans. So yummy! Both the BF and me have made this countless times. We went camping couple weeks ago and made it in a dutch oven on the campfire – just threw everything in together. It was the best batch yet! Make this dish!! It was so delicious, I will make this again. AMAZING.. and more! Thank you for this great recipe.. I will be making this often. I saw somewhere if you soak lentils they will keep a better texture? How long? Isa, my sister gave me two of your cookbooks (Pie in the Sky and Brunches) for my birthday last summer and I am totally in deep love with every one of your recipes! And finding your website = wow!! Thank you for sharing your creativity with us all. This chili is fabulous – we enjoyed it with your cornbread recipe tonight. It is delish before adding the coconut milk, so I saved half of the chili for later w/o to cut back on fat a bit. I had some soy chorizo (by Casique) in my fridge so that was browned and thrown in too. I’m making this again and again!! Bless you for appearing in the World Herald today! I had lost your recipe for this fabulous dish and you magically showed up with your great story and I was able to retrieve the recipe. I have served it to friends and they too love it. Keep cooking, Isa!!! Made this and thought it was great. Didn’t really remind of chili but it was a yummy warming veggie-friendly ‘stew’. Perfect for fall and winter! Lots a flexibility in the spices and ingredients too – i liked a lot more heat so added cayenne and some other indian spices i had in the cupboard. Thanks for the recipe! Loved this and just posted a link to your recipe on my blog VeganViola.com — thanks for the inspiration! This looks absolutely perfect~! Can’t wait to try it…. I just made this for my oppositely vegan parents (basically living the SAD life) and they LOVED it. My dad said that it was the best vegan thing that I have ever made for them 🙂 I did pinto beans instead of kidney beans and also halved the recipe. I also used just regular curry powder instead of thai red chili because that’s all that I had. DELICIOUS!! Would using the brand SO Delicious coconut milk work? I was only able to find coconut milk near the mixer section at a local supermarket. It looks likes it’s used for piña coladas and loaded with sugar. Any thoughts? My Dad’s wife sent me your book just last week, she knows that I’ve been eating more vegetables and weaning off meat based diet and this was my first recipe! It is delicious…I read some of the other comments and I might add a little lime on my next bowl. Can’t wait to make my next meal! This is delicious. D.LI.SHUS. I love that I could probably trick even the most ethnocentric eater into trying it given its branding of “Chili.” I added extra curry paste and chili powder but I think next time I will add some thai chilies to the onion/pepper fry. I bet there are a bajillion fun toppings that could be added for texture and color! Thank you for sharing! Made this tonight and it was amazing! My boyfriend, who is not vegetarian but enjoys veggie food, requested this recipe when we were looking for new soups/stews/curries to try during the colder months. I loved that everything came together so quickly but still had a lot of flavor and nutritious ingredients. Will enjoy the rest of this batch and make again. Big fan of your books- thanks Isa! This was a fantastic meal! My husband and I like to make something big like this and eat it for lunch at the office for the week. It will definitely last us all week and it’s so flavorful! According to my loseit app it’s also only ~260 calories a serving (with the oil omitted and green lentils instead of kidney beans). This recipe is a keeper! This was stupendous, easy, delicious and made a ton. I am adoring “Isa Does It.” Thank you! Isa, I have to say you’re my new hero!! This is the third recipe of yours that I’ve tried (chana masala is outstanding & so is your gingery coconut stew) and and they’ve all become absolute favorites in my house!! Thanks a million and keep up the great work! The temps dropped to 15F for the first time this fall. Work was closed due to a power outtage. I made this with what I had in the house. Red beans and kidney beans. Russet Burbank potato supplemented my one sweet potato. This hit the spot with some brown rice. Tasty tasty tasty. I’ve made this a bunch of times and every time, it’s spot on. Really a good recipe. The spicing is right. I bet it would be lovely with black beans, a little corn and topped with some cilantro. Thanks, Isa! Tasty as always. Awesome, easy, very flavorful! Thank you! This is SO GOOD! I followed your directions almost exactly but I put the red pepper in with the rest of the ingredients at the end. It gave it a little crunch. Also, I started the chili in a 4 quart pan but it ended up being too small so I had to transfer everything after I boiled the first few ingredients. This is the best chili. I’m going to try really hard not to cook it too often, I don’t want my boyfriend to not get excited for it when I make it. Thank you! I had a dream about this recipe last night. My copy of Isa Does It is still in boxes from a recent move, and at this point I could probably make it from memory, but thank you for posting it online. This recipe is delicious, makes a ton of food (so great for packing lunches) and even non vegs get a real kick out of the flavor combinations. Thanks again! This recipe works very well. I’ve made it several times now. Even meat eaters liked it. That’s a winner. Isa, I wanted to let you know that I made a batch of this and brought it over to the disaster relief center to feed the flood relief volunteers who are helping the flood victims here in central TX. They all devoured it! They loved that it was healthy and tasty and homemade! Thank you for this great recipe! New vegan here. 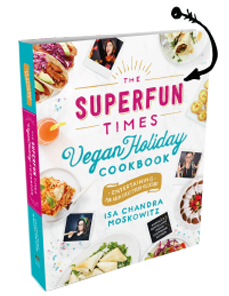 My daughter bought your book for me and I cooked this last night for myself and my (non-vegan) family. Everyone loved it. It was A-mazing 🙂 And the daughter that bought the book is really pleased with herself. This is one of my favorite recipes and always goes over really well with everyone. I make it and freeze individual portions to take for lunches. Thank you so much for this recipe. YUM! I made this today, used russets and cashew milk instead of sweet potato and coconut milk, and made it in the Instant Pot. This one is a keeper. It reminded me of a dish at an Indian Restaurant, but this was way better. The flavours were tasty but my tastebuds were confused, so I am not sure if I enjoyed the flavours together or not. Will try it again tomorrow since I made such a huge pot and decide! I ran out of onion so I added some extra garlic, and I sauteed it with the pepper, sweet potato, chili powder (I used less) and curry paste for a bit before I added stock. I also ended up adding the juice of half a lime and added 2-3x the cilantro and found it much better that way! Definitely add the lime juice right into the chili itself. I have made this twice, and it is excellent. To the December poster, if you cut the onions, and substitute Garlic the flavor will radically change! Onion is one of the key members of the French triumvarate that is the basis of most classic soups (onion, celery and carrot or parsnip = mirepoix) Garlic is really a spice, not a base like onion. I increased the recipe by 50%, and scaled all the ingredients accordingly. I skipped lime, and simmered MUCH longer, like 2 hours. At that point, the sweetness of (real) sweet potatoes diffuses and quiets the heat of the chile pepper (I used hot Chipotle pepper). I thought it was too hot when I sampled it, but after thorough mixing and all ingredients were added on schedule, it quieted to medium hot, by most Asian standards that I have had. I added Thai Curry at the end, increased it a little beyond the recipe, and it seemed just right. This is my favorite vegan chile! Ok, I’m almost embarrassed to ask but need to know, are lentils dry or canned ( if they come in a can ) ? Never have prepared anything with lentils. This is a great recipe! I have brought it to potlucks with great success. The coconut milk makes it delicious. After paying extra for red lentils the first time, I just use regular lentils because they faded to gray anyway. I agree with the previous poster … use regular brown lentils. They’re more substantial, give the stew a more hardy texture, a richer flavor, a more gravy like structure, and are easier to keep from falling to complete mush. My new favorite chili! We have an annual chili contest at work. I just won with this recipe! First time a vegetarian chili has ever won. I followed your recipe pretty much with a few modifications: carmelized the onions for a couple hours, added garbanzos in addition to kidney beans, and used more sweet potatoes and peppers. I just discovered your blog while looking for usual chili recipes, can’t wait to try your other recipes. Thanks for sharing your creative ideas! Wish I could have seen your show! Do you have any plans to take it on the road? I’m in Boulder and think you’d find a very receptive audience here. Email me directly if you’d like to talk about bringing it here. intelligently about. Now i’m very happy I stumbled across this in my hunt for something relating to this. Can the extra chilli be frozen? I’ve frozen the chili and it reheats just fine. The sweet potatoes might get a bit softer but it’s still delicious! Thank you Isa! I first had this at a Vegan Chili Cookoff in the park. Saw a sign on a post downtown. Went to the park and met a bunch of young excited Animal Rights Activists and tried several Vegan Chilis. That day changed my life. This Chili is my go to for most Potlucks now and everyone goes wild over it, every time. I use regular coconut milk and green curry paste because I love the flavour more. It freezes well so I usually double it. I love bringing food that is cruelty free and sharing my love for food and animals at the same time. Had this bookmarked forever and finally made it. F A N T A S T I C!!! Made it exactly as the recipe states and it is a perfect recipe. We are obsessed. Thank You! The ads popped up right away asking for $18 to continue using it.http://letsdownloadfromalyssa.club It takes just one minute and it will worth so much to me, so Thank You very much. OMG this is absolutely delicious! I altered the recipe a bit, as I wanted more of a Thai soup vs. a chili. I finely diced the onion and red pepper and cut the yams into very small pieces. I reduced the lentils to 1/2 cup and added 1/2 of white rice. I also reduced the chili powder to 1 teaspoon and the red curry paste to 2 teaspoons. Used a 15oz can of crushed fire roasted tomatoes instead of 28 oz. of diced. It was absolutely divine, thank you so much for the recipe!